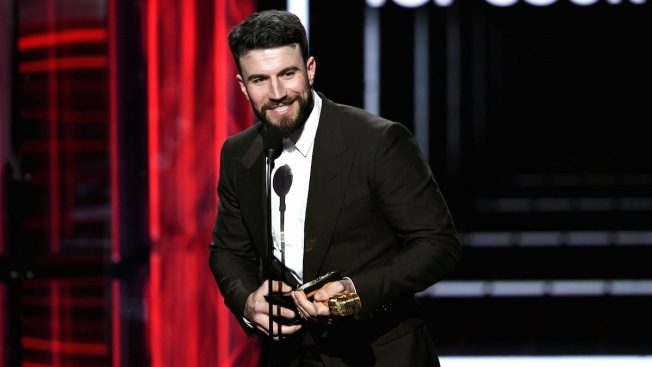 Sam Hunt accepts an award on stage during the 2018 Billboard Music Awards at MGM Grand Garden Arena on May 20, 2018 in Las Vegas, Nevada. Hunt's "Body Like a Back Road" is nominated for song of the year for the Country Music Association Awards. 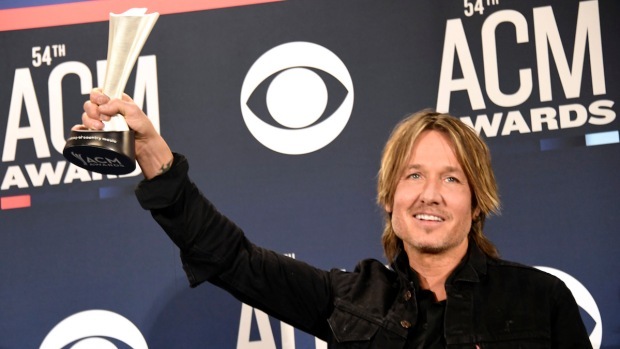 The midterm elections are over, but the contest for the year's best country songs is just around the corner at the 2018 Country Music Association Awards. Nominees include a monster pop song that went country, country songs that went pop, a message song for the #MeToo era and, of course, drinking songs. Song of the year is awarded to songwriters, while single of the year goes to the artist, producer and mixing engineer. The CMA Awards will air live on Nov. 14 from Nashville, Tennessee. Here's a look at the single and song of the year nominees. This song was originally pitched for country singer Tyler Farr, explains Josh Thompson, who co-wrote the song with Brandon Kinney and Jeff Middleton. When it didn't make Farr's album, Aldean grabbed it and turned it into a No. 1 hit. The three writers were on the road in 2013 when they wrote it, staying up until 4:30 in the morning while drinking whiskey to finish it, Thompson said. "I am huge believer in the idea that you've got to get in the character of your song," he said. Thompson said the twist on a whiskey song and the opening line make it unique, but the production and turning it into a duet made the song sound like a new classic. 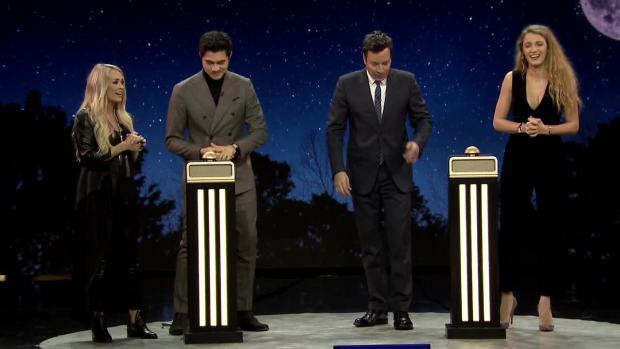 Blake Lively and Jimmy Fallon team up against Carrie Underwood and Henry Golding in Central Park as they try to guess random songs The Roots and the New York Philharmonic are playing one instrument at a time, like Justin Timberlake's "Cry Me a River." "It feels modern and timeless at the same time and the smoky Miranda notes in there just send it through the roof," he said. Mike Henderson has written with Stapleton for years, long before they were both in the bluegrass band The Steeldrivers and way before Stapleton broke out with his 2015 solo debut, "Traveller." "I was reading Keith Richards' biography and he had a chapter called 'Broken Halos,' and as soon I saw it, I was like, 'Whoa, song title," Henderson said. The track won the best country song Grammy earlier this year, making it a strong contender in both CMA categories, and the emotional way Stapleton sings the song makes it a fan favorite. "We've had a lot of folks say that the song had a really special meaning for them — people that have lost a loved one, who had been through some personal tragedy," Henderson said. "It does seem to touch people, which as a songwriter, you're trying to do." Dan Smyers and Shay Mooney genuinely love tequila. They drink it on tour and at home, but the duo wasn't really looking for party song about getting drunk. "So we flipped that," said Smyers. "Tequila was basically the trigger that took you back to a certain place, so it's a nostalgic heartbreak song, which is kind of Dan + Shay's wheelhouse." The song, co-written with Nicolle Galyon and Jordan Reynolds, crossed from country to pop radio, even peaking at No. 21 on Billboard's Hot 100 chart. Smyers said he's sees the crossover success as an advantage in building fans among people who don't traditionally listen to country music. "This could be their gateway into country," Smyers said. "They hear that song and say, 'I love that,' and flip over to the country station." It's the song that has dominated country music for all of 2018. The inescapable, record-breaking monster hit has surpassed 1 billion streams, achieved four-times platinum status and reached No. 2 on the Hot 100 chart. Songwriter David Garcia wrote the song in Los Angeles with Rexha, FGL's Tyler Hubbard and songwriter Josh Miller and it was originally released on Rexha's 2017 EP, "All Your Fault: Pt. 2." "There is a little more merging of L.A. and Nashville now more than ever," Garcia said. Garcia said while he'd love to see the song win, he's not putting any bets down. He attributes the song's success in part to Rexha's huge streaming popularity. But it's also a polarizing contender with many arguing it's not a true country song and its crossover success could turn off some more traditionally-minded CMA voters. Garcia said he doesn't concern himself with those critics. "I believe we're in an amazing place where the fans and the listeners decide what their favorite songs are," he said. "I think the song is undeniable in what it is." Both songs were created in part by the songwriting-producing power duo Shane McAnally and Josh Osborne, but they are on different spectrums of the genre. Sam Hunt's 2017 hit crossed to pop and became a five-times platinum success with a catchy, finger-snapping rhythm. But even McAnally admits to being a bit surprised about seeing it pop up on the nominee list again after it lost last year in the same category ("Better Man," written by Taylor Swift for Little Big Town, won the prize). Even though it was not released in the eligibility period, Hunt's song made the second ballot because it remained a Top 5 country single. The fact that "Body Like a Back Road" hasn't won any CMA Awards, despite being nominated three times, suggests that pop crossovers might not be the key factor to winning. "There's a five-way race for this one," McAnally said of the song of the year category. "There's not a 'Girl Crush' that feels like a steamroller. I just don't know who could win." Meanwhile, Midland broke out as a neo-traditionalist band with "Drinkin' Problem," a George Strait-style throwback. "I would love to see it win single of the year because of its traditional sound," McAnally said. "(Single of the year) is about commercial impact, but I've always thought about it as the sound of the record." Most country singers steer away from politically charged topics, but during the #MeToo movement, Janson had a pointed message for men. "Take the drunk girl home," he sings, and walk away. Janson said he wrote the song with Tom Douglas and Scooter Carusoe long before #MeToo spread virally last year, but with Brett Kavanaugh's confirmation hearings this year, the song was relevant enough to gain a nomination. "I am not really a soapbox guy," Janson said. "I just write what I write and sing what I sing. I do believe in the message very powerfully and I am glad that it is connecting." CMA voters do like message songs: Tim McGraw's "Humble and Kind" and Kacey Musgraves' "Follow Your Arrow" both won because they had something important to say. But the bluntness of the song has given some critics pause, most notably when a New Yorker column called it a "#MeToo misfire." But Janson says he's not trying to appeal to everyone. "I've never really tried to sell this song to anybody or shove it down anybody's throat," he said.